Make your team page your own by adding some personal touches. Update the personal message explaining what motivates your team and why you are supporting MS, or upload a photo of your team training. Your team page will display your team members’ personal pages as well as tracking your team fundraising total! Your team’s hard work makes a real difference – and we want them to know it! Make sure you keep your team motivated by giving them regular updates and congratulating them on their achievements. 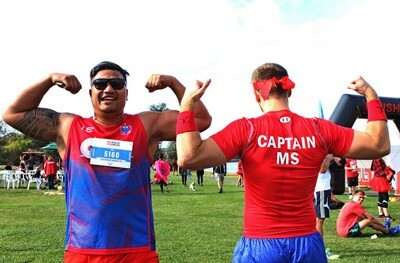 As team captain, you’ll be notified when team mates reach fundraising milestones and you can email them all directly through your fundraising portal. Why not organise a team training activity or joint fundraising event to bring them all together before the big day? Some things take a little more organising – but really do make all the difference! Team fundraising events are always a great way to boost everyone’s fundraising, bring the team together and get the word out there about your participation. We love seeing teams come together and enjoy themselves on event day! Try some fancy dress or wear red to make a statement. Our team photos at the event village are a fantastic way to grab a memento of the day. Take your time, enjoy the day and have a laugh with your mates!